Where are the best beaches in Tortola? Tortola has some of the best beaches in all of the Caribbean. I really do believe that some of the best beaches in the Caribbean are found right here in Tortola. I'm not alone, every year Tortola's best beaches are plastered all over countless magazines and websites. There aren't that many beaches, but each one is unique in its own way. Once I get off the plane I can't help but hit the beach immediately. I love to get there and stick my toes in the warm sand and watch as the waves roll in. All the while feeling those tropical breezes and enjoying a refreshing rum punch. It's like my little piece of heaven on earth. 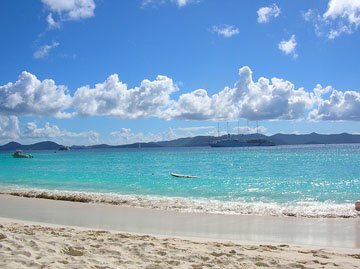 I want to give you the rundown about what there is to do and see on all of the best beaches of Tortola. 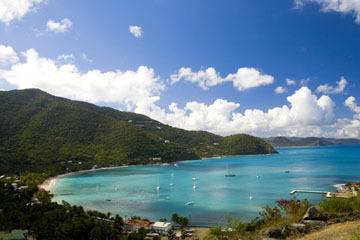 From there I'll let you tailor your Tortola vacation to meet your own specific needs. 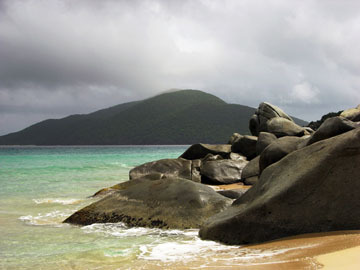 Cane Garden Bay: This is by far the most famous of Tortola's beaches. Cane Garden Bay is the closest beach to Road Town. Therefore, more tourist hit this beach than any other. This is especially true if a cruise ship has docked. Don't make a trip to Tortola without seeing this beach! Brewers Bay: Is the opposite of Cane Garden Bay. Here you'll find a campground but little else. Be very careful driving here, the road to Brewer's Bay is one of the hairiest on the island. There isn't really any development here, but it is one of my favorite beaches. You can just lie in the shade of the coconut trees and forget all of your worries. 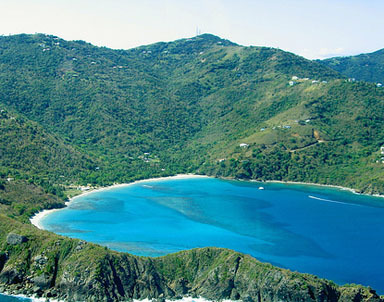 Long Bay: Is split up into two beaches Long Bay East (on Beef Island) and Long Bay West (Tortola). Long Bay East: Has some amazing scenery, but little in the way of amenities. After you drive over the bridge to Beef Island hang a left just past the salt flats. The swimming here is excellent because there is little undertow. The locals consider this the best beach on the island. 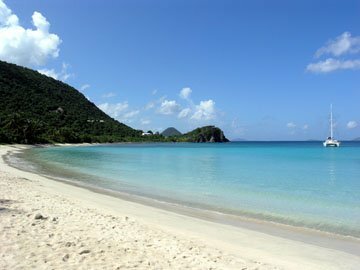 Long Bay West: Is a beautiful mile-long stretch of white sand that I love to stroll down during a Tortola sunset. Here you'll find the Long Bay Resort which provides all types of water sports gear. Grab a drink from the 1748 bar, or if romance is in the air check out the Pasta House. This is an 18th century sugar mill turned Italian restaurant has some of the best food on the island. It's only open for dinner two days a week, so get your reservations early. Smuggler's Cove: If you're brave enough to drive the rut-lined road to Smuggler's Cove you will be handsomely rewarded. This crescent shaped swath of sand has plenty of seagrape trees for shade and some good snorkeling as well. Steven's Beach Bar is the place to get an tasty island drink or even a hot dog. They also rent snorkel gear here, if your looking to make a splash. Apple Bay: Is a surf haven, its rolling tides make it the best beach for shredding some waves. January and February are the best time to catch some waves, but check the weather before you leave. Other times of the year are more hit-and-miss. So if you want to surf please book your trip in the winter. 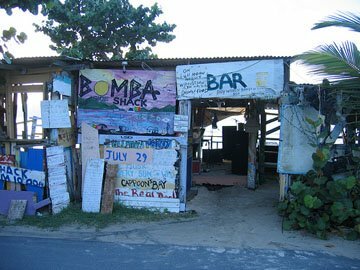 Bomba's Shack is a famous Caribbean beach destination. It's an adults-only atmosphere though. Apple Bay is also home to Sebastian's, a small surf side resort. If your hungry, mosey over to Sebastian's for their Friday night fish fry. Lambert Beach: Is the location of Lambert Beach Resort. Home of the Turtle Restaurant which serves some wonderful Sunday brunches. On this beach you'll find many water sports activities available. If the North swell is up then you can surf some good sized waves, but be careful to check the undertow before you get to deep. 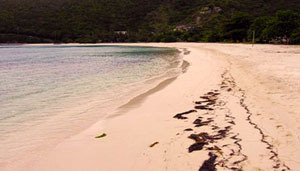 Brandywine Bay: Is the only beach on this list located on the south side of the island. If your looking for the best beach that you can have all to yourself, then come here. There's no undertow and the swimming is quite good. There is limited shade, but the beach is quite good if you like to collect sea shells. Josiah's Bay: Is at the top of many local surfers best beaches list. Many times you can find yourself all alone here, that's one reason I like it so much. 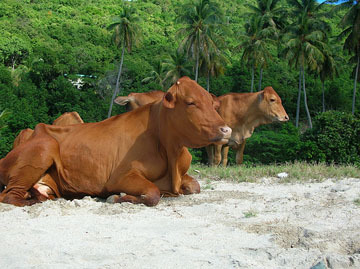 The beach here backs into a farming community and you can often see more cows lounging in the sun here than people. There are strong undertows at each end of the beach so try to steer clear of that. Food options are Josiah's Bay Beach Bar, Naomi's, and Secret Garden. Just up the hill a bit is the Tamarind Club, I really love their toasted coconut ice-cream pie. Now that you've learned some of the secrets about Tortola's best beaches, it's time to pack up your suntan lotion and make your way towards the sand. I hope I've provided you enough information to hit the spots you want to hit, and save the rest of the beaches for your next trip.